Renowned for fusing pop, reggae and dancehall, the beautiful Denyque has also captured our attention by flashing that incredible smile of hers, it even attracted international attention when she was recognized and listed as one of Complex Magazine’s “Top 25 Sexiest International Singers”. Denyque feel good song "Smile To The World" was produced and is the brain child of Johnny Wonder while the riddim created by billboard chart topper producer Adde Instrumental. Distributed by digital giants 21st Hapilos Digital, "Smile To The World" is now available to all on itunes. Critically acclaimed Stephen "Di Genius" McGregor recently released a start studded lineup of the biggest names in dancehall with "Guitar String Riddim". Grammy award winner Beenie Man hit single "Feel So Good" is now available as a single download on itunes distributed by 21st Hapilos Digital. Fresh from several memorable performances for the Memorial Day weekend, international dancehall star Konshens releases "Care Zero" produced by ArmzHouse Records. The single on the Fire Supreme Riddim is distributed by 21st Hapilos Digital is now available on itunes. Distributed by digital giants 21st Hapilos Digital, Famed label Armz House Records presents international dancehall star Mavado with "Paypa" from hit "Fire Supreme Riddim". The hit single is now out on itunes. Fresh from his historical musical exploits in the holy land of Israel where he delivered a pair of concerts in Tel Aviv and Jerusalem, Demarco still finds the time to hit the studio for chart topping hits. His latest "Dutty Badmind" (Guitar String Riddim) produced by Di Genius Records is now available on itunes via 21st Hapilos Digital. It is already a busy season for the young dancehall artist Alkaline, international touring, videos, and new music such as the hit single "Little Harder" on the Armz House Records "Fire Supreme Riddim". Distributed by 21st Hapilos Digital, "Little Harder" is now available on itunes. in Disguise" is now available on itunes. It's a family affair when singjay Chino releases "Just One Man" produced by his brother Critically acclaimed Stephen "Di Genius" McGregor. On the blazing Guitar String Riddim, the single "Just One Man" is out now on itunes via 21st Hapilos Digital. International dancehall star Mavado and popular veteran artist Buccaneer perform "Badman" (Guitar String Riddim). Distributed by 21st Hapilos Digital, the hit bound single was produced by Di Genius Records. "Badman" is now available on itunes. 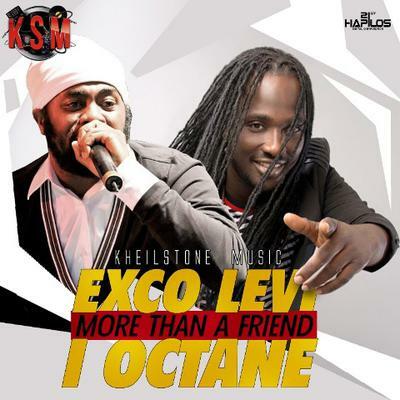 It is a musical combination perfection when Three times JUNO Award winner Exco levi and Reggae star I Octane perform "More Than A Friend". Produced by Kheilstone Music, the single distributed by 21st Hapilos Digital is out now on itunes. Starstruck Records presents "Kreech Dance" performed by popular dancehall star Bling Dawg and Kreecha. Distributed by 21st Hapilos Digital, "Kreech Dance" is out now on itunes. Stephen "Di Genius" McGregor put on his artist hat as he performed the hit single "Good" on his own production of the "Guitar String Riddim". "Good" is out now on itunes distributed by 21st Hapilos Digital. Jamlink Recording presents the cleverly titled "Thumb Drive Riddim". Hurry and download the riddim that features Mr Liz "Galactic Gallis", Ill Gramma "Back It Up", Inkline "Wi Haffi Mek It", R Vee "Party Tun Up" and Beres brown, Big Pop and Di Great One with "I Know You Want To Ride". The riddim is now available on itunes via 21st Hapilos Digital. E5Records presents "Bad Reputation Riddim" featuring some of the hottest artists in dancehall such as Vybz Kartel with the title track "Bad Reputation", Agent Sasco "Self Defence", Bugle "Give Thanks", Chase Cross "Friends & Foe", Erup "Beat Dem" and Versatile "Mama Say". Out now on itunes, the riddim is distributed by 21st Hapilos Digital. Undoubtedly one of Jamaica's most talented younger producer, Tarik "Russian" Johnston label Head Concussion records and international dancehall superstar Vybz Kartel presents "Yellow Yellow". The blazing single "Yellow Yellow" is out now on itunes distributed by 21st Hapilos Digital.